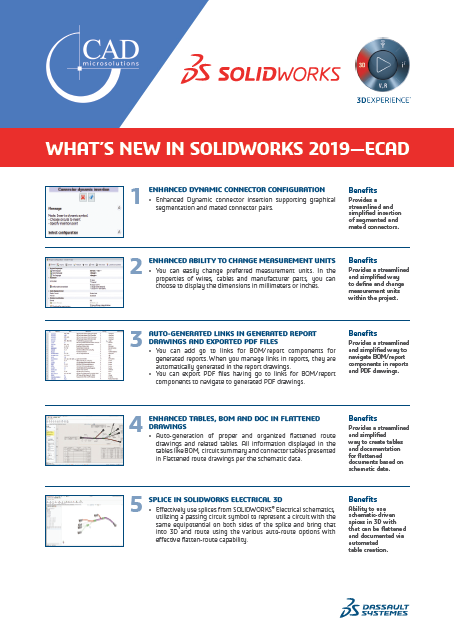 SOLIDWORKS 2019 provides the breadth of tools to tackle the most complex problems, and the depth to finish critical detail work. 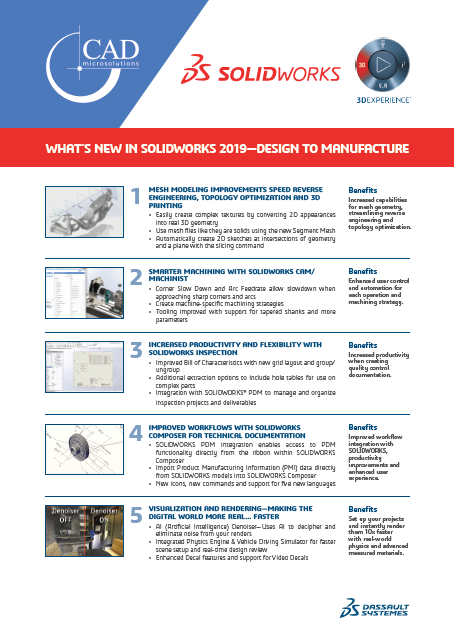 New features help you improve your product development process to get your innovative products into production faster, and new products in the SOLIDWORKS Solution Portfolio will help you maximize the productivity of your design and manufacturing resources. 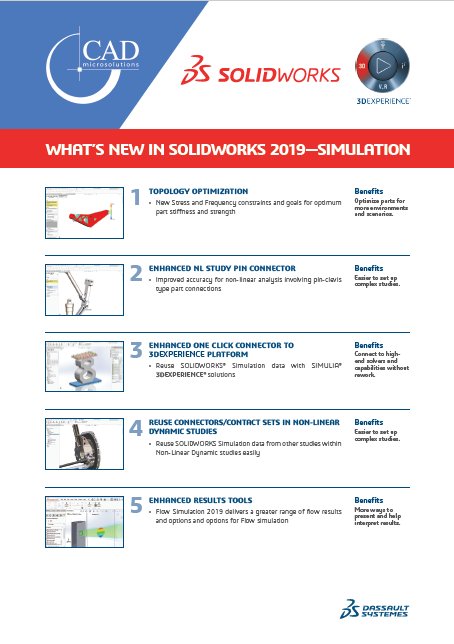 Check out the new features now available in SOLIDWORKS 2019 - many of which are in direct response to user requests – that provide users a suite of seamlessly integrated software tools that allow you to go from concept to manufactured product faster, all in the native SOLIDWORKS environment. 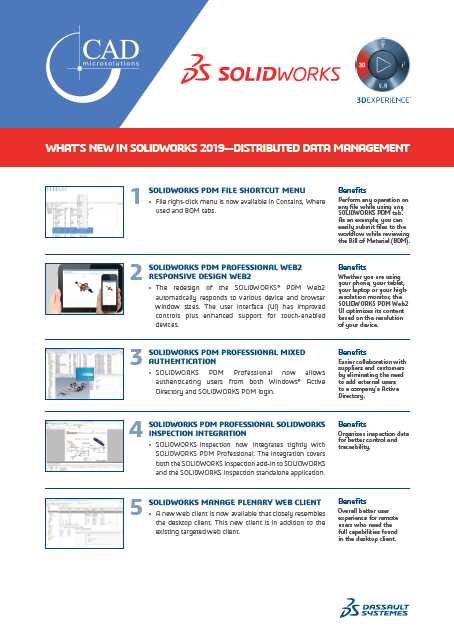 Three solutions (Standard, Pro, and Premium) that utilize the intuitive SOLIDWORKS user interface to speed your engineering and design processes. SOLIDWORKS Simulation let you set up a virtual real-world environment to test and analyze all of your product designs. SOLIDWORKS Plastics brings injection molding simulation directly to the designers of plastic parts and injection molds. Enterprise PDM Eliminates concerns about version control and data loss to improve design collaboration and reuse. SOLIDWORKS Composer helps user create everything from training manuals, user guides, service manuals from sales and marketing materials. SOLIDWORKS Electrical solutions help Design Engineers reduce the risk inherent in innovation and get their products to market faster with less physical prototyping to decrease costs.